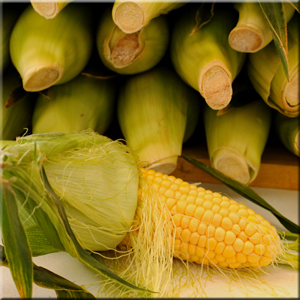 Although available year-round from various regions, freshly picked corn-on-the-cob is synonymous with summer. Corn grows in "ears," each of which is covered in almost uniform rows of tightly packed kernels (a single ear of corn can contain up to 400 kernels). These rows of kernels are protected by the silk-like threads called "corn silk" and encased in a tightly bound lime hued husk. Athough we often associate corn with the color yellow, it actually comes in host of different varieties featuring an array of different colors, including red, pink, black, purple, and blue. Although corn is now available in markets year-round, it is the locally grown varieties during the summer months that not only tastes the best but are usually the least expensive. Corn has many culinary uses and can be cooked using a variety of techniques. First blanched, then cut off the cob, corn can be combined with other summer vegetables and dressed with vinaigrette for use in salads, it can be cooked together with other vegetables for use in succotash and vegetable components. Corn makes a great creamy soup on its own or as part of summer minestrone. It can be added to polenta, risotto, pastas, and pizzas. Or, just simply eat in on the cob, seasoned to taste. However you choose to use it, use it quickly, within 2-3 days, as corn typically begins to lose its sweetness shortly after harvest. A surprise that greets corn shuckers is a kind of corn fungus that may produce a creamy colored growth with a texture resembling that of a mushroom. In Mexico, this fungus is known as huitlacohe, and is prized as a delicacy, gently cooked and wrapped in crepes or tortillas.